The European economy continues through its “Perils of Pauline” drama. The latest positive news, European Central Bank chair Mario Draghi’s “whatever it takes” statement last week, afforded the U.S. stock market its customary 48 hours of euphoria. Whether the market will continue walking on air this week – or more importantly, will have good reason to in the weeks and months to come – is uncertain. However, other economic news is less than favorable. The economy has apparently lost the momentum that it showed last winter and early spring. Growth in the second quarter has clocked in at only 1.5 percent, which does not meet Federal Reserve chair Ben Bernanke’s criterion of supporting improvement in the labor market. Even if the good news from Europe should stand up, the U.S. economy may already have drifted below stall speed, and be heading for an outright downturn. If we are anywhere close to that point, the economy may soon need a boost. For economists, one of the most unfortunate pieces of fallout from recent political developments has been the demonization of the word “stimulus.” It always is difficult to communicate to the public that, yes, things have improved at a frustratingly slow pace, but were it not for a particular policy intervention, things would have been worse still. A policy that makes things less bad should be called a success, but to the non-specialist public, because things are worse than they once were, or worse than expectations, that policy usually is deemed a failure. This week, the end-of-year automatic policy changes that were originally intended to steady the shaky federal budget appeared to rise in public concern. A Wednesday front-page above-the-fold Washington Post article was headlined, “For U.S., economic worries come home / ‘Fiscal cliff’ is replacing European turmoil as top threat to recovery.” The Congress debated (to the extent that its free-form discussion without specific legislation on the table is “debate”) the issue at length. There is no time to waste. 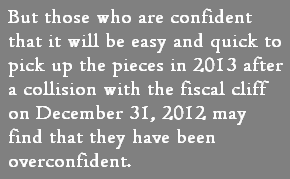 As we approach the end of the year, we get closer to the edge of the “fiscal cliff”. If there is no political deal, the US will face a triple witching hour of automatically triggered spending cuts, the expiry of tax cuts, and a failure to raise the debt ceiling. We all saw what happened during the last debt ceiling “discussion”. It wouldn’t be a surprise to see the same dysfunctional process or another agreement to “kick the can down the road”, as they say in Washington. CEOs can no longer stand on the sidelines. We need to ensure debt resolution is a core part of the presidential election campaign. Mr. Cote offers five specific recommendations for U.S. CEOs. He was a member of the US fiscal commission chaired by Erskine Bowles and Alan Simpson. Ed Crooks from the Financial Times features Mr. Cote’s remarks in his piece.